Dubbed the “doyenne of the South African herb industry” by Get It Hartbeespoort, Margaret (also a qualified physiotherapist) was a “national treasure”, as her daughter, Sandy, describes her on the Margaret Roberts Herbal Centre website, margaretroberts.co.za. Flourishing not only from Margaret’s extensive knowledge and range of lavender, but also from over 50 years of her experience in natural healing and more than 40 titles published on herbs, natural healing and healthy living, the herbal centre is so much more than a mere nursery. It was designed to educate the public on herbs, medicinal foods and natural insecticides; the centre also promotes natural wellness, organic farming and organic principles. Sandy had been in business with her mother for 30 years, and proudly and passionately continues with their work, so that Margaret’s legacy lives on. According to Sandy, this was the only cheesecake her mom would eat. Sandy serves her famous cheesecake at the restaurant of the Margaret Roberts Herbal Centre, situated in De Wildt/ Hartbeespoort. Margaret is, of course, well known for her love of lavender, but Sandy says she loved roses as well. She never went anywhere without her set of pearls and adored fine china, silverware and embroidered linen. For the crust, blitz the shortbread biscuits and melted butter together in a food processor until fine. Press into a 20cm-diameter greased and lined springform cake tin and refrigerate until set, about 30 minutes. For the filling, whisk the cream cheese until smooth, then mix in the condensed milk, vanilla and lemon juice. Pour the 250ml (1 cup) boiling water over the rose petals and 2 lavender sprigs, and allow to infuse, 2 minutes. Strain and add the gelatine powder, then stir to dissolve. Allow to cool to room temperature. In the meantime, make the stewed berries by placing the fresh/frozen mixed berries in a small saucepan with 2 tablespoonfuls water, and simmer gently until softened and the berries have broken down, about 5 minutes. Allow to cool completely. Fold the cooled gelatine mixture into the cheesecake mixture along with the freshly whipped cream. Pour over the shortbread biscuit base. Spoon over the stewed berries and swirl gently with the back of a teaspoon. Refrigerate until set, about 3 – 4 hours. 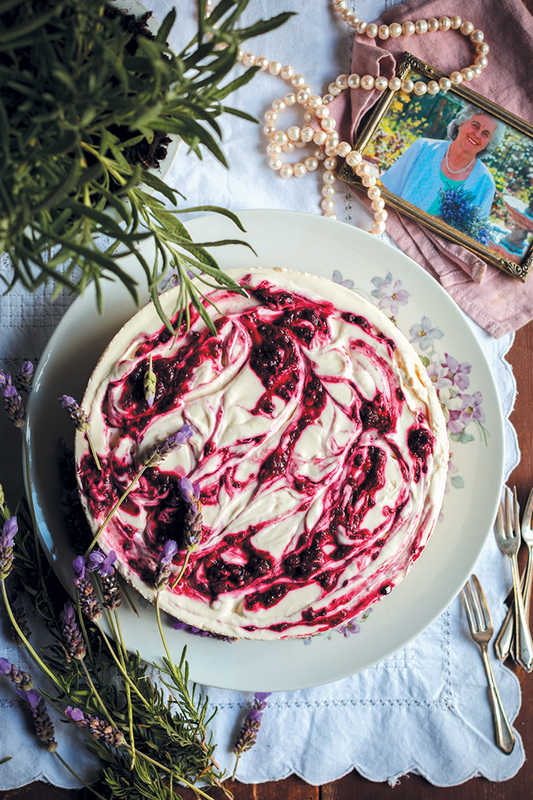 Unmould the cheesecake and serve decorated with extra lavender sprigs, if desired.